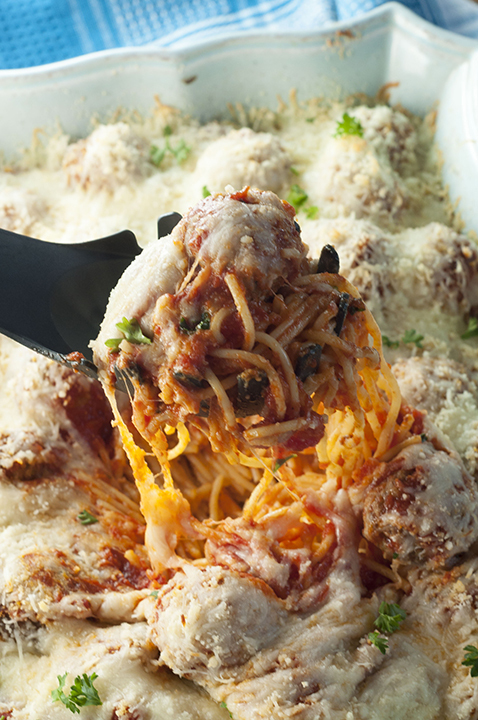 Italian Baked Spaghetti and Meatballs Casserole is a delicious change from your everyday pasta and sauce. This will be a new family favorite comfort food recipe! 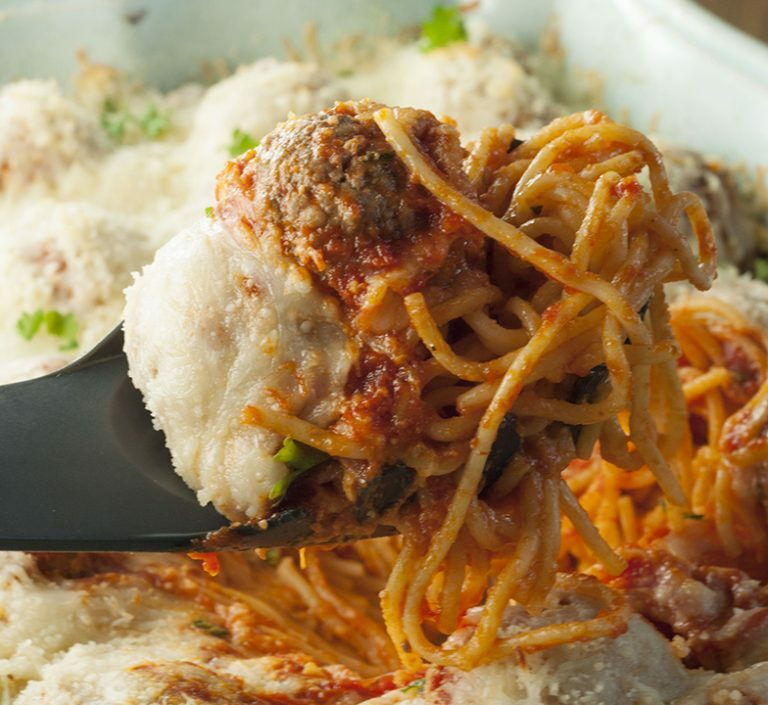 I’m thrilled to share this Baked Spaghetti and Meatballs Casserole with you today as it is totally fancy enough to be made for the holidays. This is seriously the perfect dish to cook up for a hungry crowd or for your family for an easy weeknight meal! It’s hearty, delicious, easy to make, and extremely budget-friendly. Kids will also love this meal! I used Tuttorosso tomato sauce for this recipe as it’s full of flavor and goes so well in this casserole. I have mentioned in several posts before about my love and devotion for Tuttorosso tomato products and I use them regularly in my house. The two best Italian cooks I have known in my family (my father and my husband’s Grandmother) used Tuttorosso and I carried on that tradition, even after they both passed on. Italian food is my passion and I like to use the products that give my dishes maximum flavor. This Baked Spaghetti and Meatballs Casserole is great for a weeknight meal but you can also serve this for the holidays. 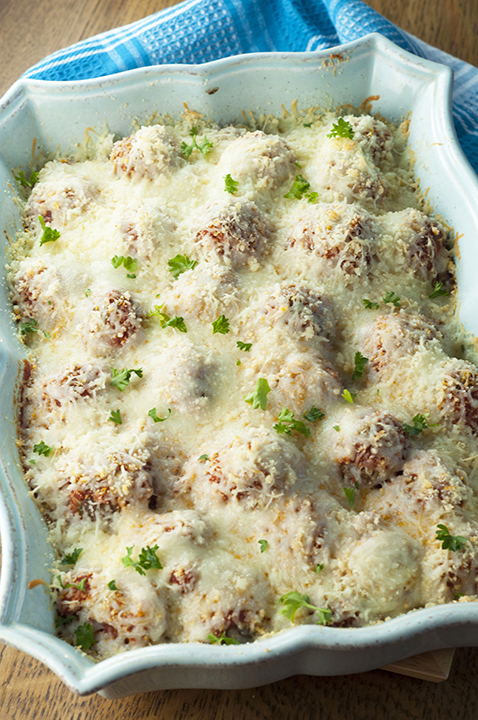 Another great option is my Baked Meatball Parmesan! With both my side of the family and Mr. Wishes’ side of the family being Italian, we are used to eating pasta dishes for Thanksgiving and/or Christmas. On Thanksgiving, the tradition is to start with lasagna and meatballs and then have the turkey dinner later on. I always feel like I have be rolled out of the hours after eating all that food, but it is totally worth it. Likewise, my dad always made his specialty sauce and meatballs for holidays while I was growing up. I looked forward to it and still prefer a good Italian meal over anything else! Sometimes I liked to get crazy and make these Mozzarella Stuffed Italian Meatballs. I think this meal may have to be added to the holiday rotation. I have pretty much tried every brand there is at my local grocery store and always come back to Tuttorosso because the quality is perceptible in the taste. They are made by Red Gold Tomatoes, a company out of Indiana. 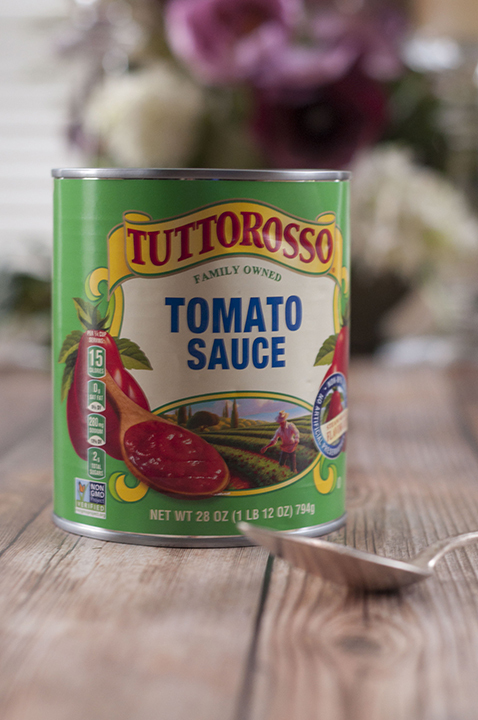 Tuttorosso is the best selling Italian-inspired canned tomato brand in the United States. Their products even taste good straight out of the can which says a lot to me as far as quality and taste. They are family-owned and take pride in their Non-GMO project verified products as well as make it a priority to ensure quality. I had the chance to visit the Tuttorosso headquarters last fall with a group of food bloggers. 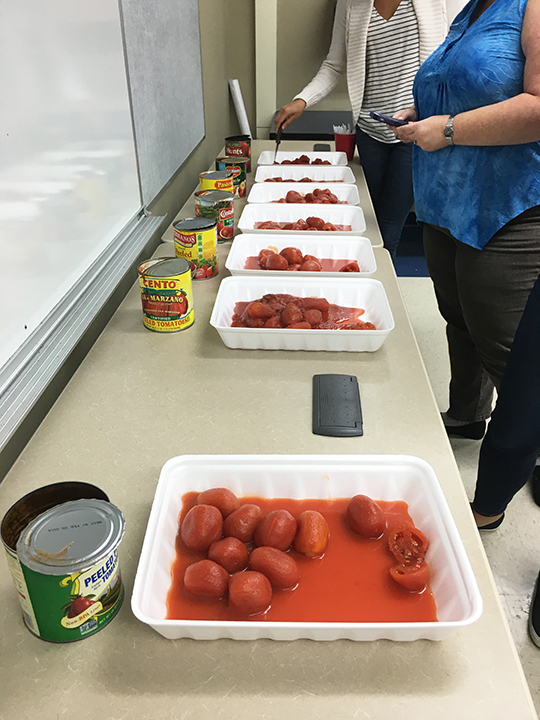 An extremely interesting task we did as a group on our last day there was opening the cans and cutting tomatoes from several competitor brands. As I said before, Tuttorosso is family-owned and prides itself on the quality of their tomatoes. Their tomatoes were really the only brand where the tomatoes actually looked like a ripe, whole tomato when it came out of the can! We cut into and tasted every brand and I can honestly say I was less than impressed with the competitors’ tomato texture and appearance, as well as the taste. You can try this at home and see what you think! We eat with our eyes and appearance is a big deal to me, sometimes just important as taste. Their products come in cans that are BPA free and lock in that fresh vine-ripened tomato flavor which makes all the difference. This ensures you don’t get that metallic tin flavor that can be a huge turn off. It’s the closest you can get to picking a tomato straight from the garden! Count me in. Of course, you can use any tomato sauce you have on hand for this Baked Spaghetti and Meatballs Casserole, but I highly recommend Tuttorosso. I hope you give this a try and love it just as much as we did! Tip: Tuttorosso products can be found here on Amazon or use their store locator to see where you can get their products at a grocery store near you! You can also try this Italian Meatball Soup if you’re in the mood for Italian! 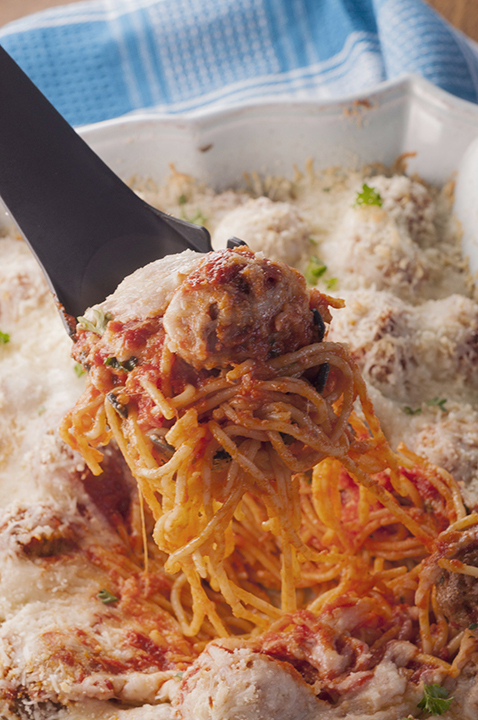 Italian Baked Spaghetti and Meatballs Casserole is a delicious change from your everyday pasta & sauce. 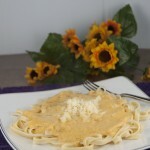 This will be a family favorite comfort food recipe! Grease a large casserole dish; set aside. Combine all ingredients for meatballs and form into about 1″ balls. Place on a foil or parchment-lined pan and bake for 18 minutes. Remove from oven; reduce heat to 350 degrees. Boil the pasta until just al dente (according to package directions). You don't want the pasta fully cooked as it will be baking afterward. Drain and toss with olive oil. Stir together egg, parsley, pepper, ½ cup mozzarella cheese, ¼ cup parmesan cheese & pepper to taste. Toss with the pasta and place in prepared dish. Pour the meatballs and pasta sauce over it. Cover with foil and bake 35 minutes. Remove foil, top with remaining cheeses and continue to bake just until cheese is melted and browned (watch so it doesn't burn). Enjoy! Disclaimer: Thank you to Tuttorosso for sponsoring this conversation. All opinions remain 100% my own, as always. Thank you for allowing me to share the brands and products I use regularly and love. 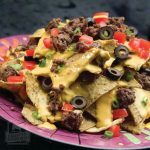 OMG – that layer of CHEESE on top is epic! I’d be happy enough just eating that for my holiday meal! I like this recipe a lot! It’s been years since we’ve had baked spaghetti. We’ve never had it with meatballs, just ground up sausage. I’d like to make this! Yeah! That looks so good! 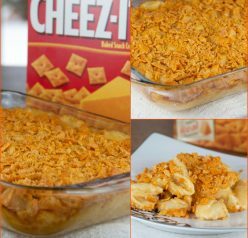 Any time you can turn something into a casserole, you should! Om nom nom. Spaghetti and meatballs is one of my family’s favorite dishes. I love this version because it’s so much easier to eat! This sounds awesome! I don’t eat beef but I use the veggie crumbles and can make this with them. I can’t wait to try it. I’m already a huge fan of spaghetti and meatballs. You’ve taken my fave dish to the next level with this casserole. I love spaghetti and meatballs but I’ve never baked mine before…you may be on to something here! I will definitely have to try this for myself soon! This is absolutely delicious! The perfect comfort food! This looks very delicious. I do love spaghetti and meatballs, but never had it like this before. I’m going to give it a try for my family one night. It looks really delicious! I wanna grab it right now. I’ll have to try this recipe. This looks hearty and delicious. I didn’t know you could bake spaghetti. That sounds easier than the way I usually do it. I need to see if my local stores carry Tuttorosso. Oh good heavens, I’m drooling now, lol. I’m going to have to get me some Tuttorosso and make this casserole. I might try adding some black olives to it?! Love the idea of adding olives! A co-worker of mine brought something similar to this into work the other day. I had never heard of it before and now I see them everywhere. Yum! This is a recipe I am saving for sure! This looks and sounds delicious! I bet our family would enjoy this for a dinner sometime. Thanks for sharing. That looks so very good. It would have been perfect when I was snowed in the house this past weekend. Looks delicious – I love anything with meatballs! Thanks for linking to my soup!